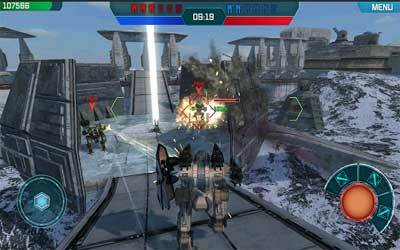 If you like to play game with your smartphone, you should try playing Walking War Robots APK 1.8.0. Actually this game will suit more for men and boys. They must love action game that offers the fight, battle, and war. Moreover, this game uses robot as the player character. So, it will be perfect game for the boys and men. You also can play it with your friends or the other players for the real battle. With the nice graphic and great features, this game is even considered as one of the best and coolest multiplayer game. You will play in a team, but you can attack the foes individually. If you play it in the first time, you will get a robot with the weapons on its arms. Your robot will be used to fight in a war with the other enemy team. There is no comprehending instructions that will guide you during the game, but only a simple tutorial. The rules of this game are not difficult. You can win the game by two ways: successfully seize and authorize all bases in war arena or kill all robots of the rival team. There are five bases that can be subdued and each team has 6 players. If you win the game, you will get the reward of game cash. This cash can be used to upgrade your robot or even to buy a new one. Total of robots in this game that can be purchased is 11 items. However, you can buy the robots if you have increased the level. So, if you want to change your robots or get the upgrades, you need not only the cash, but also achieving the specific level. Walking War Robots for Android is the best game for you who really love to play action game with your smartphone.